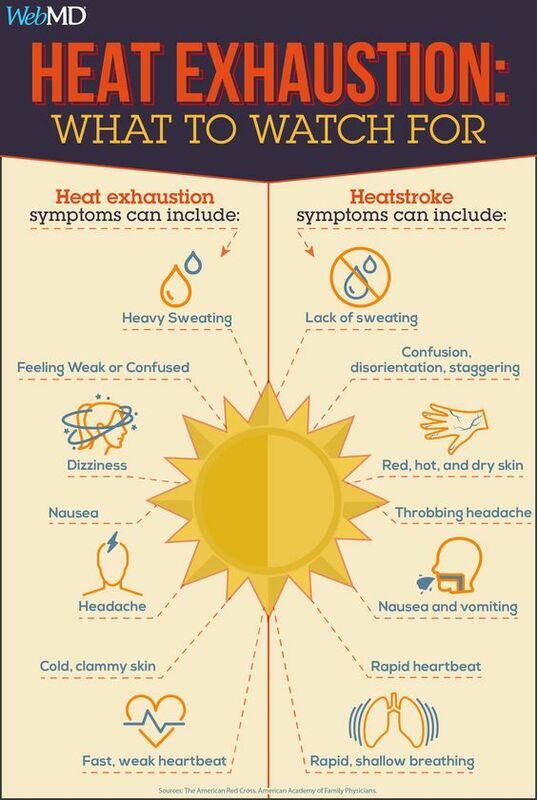 7 Safety Tips for Exercising in the Heat : Heatstroke can be a serious condition that is caused by your body reaching temperatures of 104 F or higher. The results could be headache, fainting, vomiting, confusion, seizures and even coma. But that doesn’t mean that your summer workouts can’t take place outdoors. 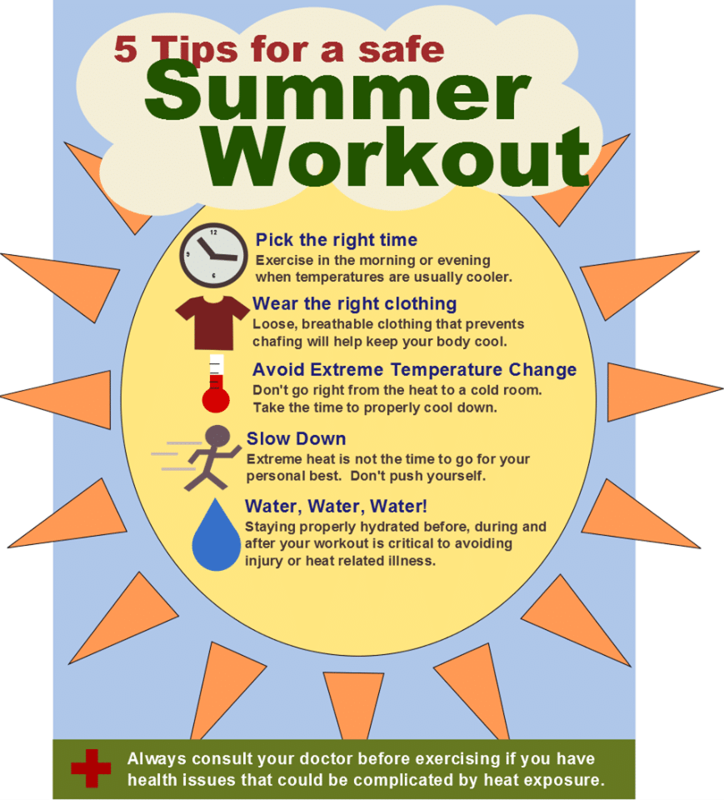 Read on for tips for exercising in the heat safely. Working out in the heat requires that you be properly outfitted to prevent heatstroke, sunburns and overheating. First of all, make sure you wear a baseball cap that fits securely on your head. This will shade your eyes so you can see where you are going. And it protects your face against sunburns and sunspots. If you already suffer from sun-damaged skin, compare the difference between high-frequency facial treatments that can help. You might also want to wear a pair of athletic sunglasses. Unlike your designer sunglasses for driving and going to the beach, these glasses have extra grips on the bridge and earpieces to help them stay on your face. Sunblock on your face and body are also a must. Now for your outfit. Choose fabrics that are lightweight, and moisture-wicking. they’ll pull moisture away from your skin, so you really do feel cooler. Choose light-colored. That way they will reflect the sun’s rays and keep you cool. Go for shorts that are breathable and a loose tank. When the breeze gets in the fabric and causes it to ripple, you’ll be glad you didn’t choose skin-tight attire. Outdoor summer fitness is all about choosing when is the best time to work out that day. Check the weather constantly. Look for the time of day that the weather will be lowest. It might be early morning before nine. Or it could be late in the evening. Try to rearrange your day so that you can avoid working out in the heat of the day. Best of all, during the morning and evenings, your neighbors might be watering their lawns. Go ahead and run through to cool off. Instead of having a strict schedule and summer fitness routine, be flexible about what you will do that day and when. For example, on muggy, humid days opt to swim laps at your local outdoor pool. And on hot but windy days, ride your bike to make the most of the breeze. If it’s raining, don’t let that stop you from doing your summer workouts. Running and biking in the rain is so refreshing. Just make sure if you hear thunder or see lightning that you head home. Do you love to just head out for a run and run aimlessly until you’ve hit your halfway time or distance marker? Well, when you’re working out in the heat, this isn’t the best plan. Instead, plan your route so that you spend most of your time in the shade. Check out the Road Runners Club of America to find running routes in your area. And when you’re out there, don’t push yourself. The heat can make a huge impact on your distance and speed. So what if you won’t beat your PR on this hot day? Give yourself permission to slow down, take rests and call it quits early. Even if you only get a fraction of your workout in, that’s OK. You can also try to head back out later that day. Working out in the heat means that you must drink a lot of water. But this is important all day long, not just during or after your workout. Remember, working out in the heat means your body uses its stores of water to regulate your temperature. So make sure your body has enough by drinking water throughout the whole day. And, avoid drinks with caffeine such as coffee and energy drinks. 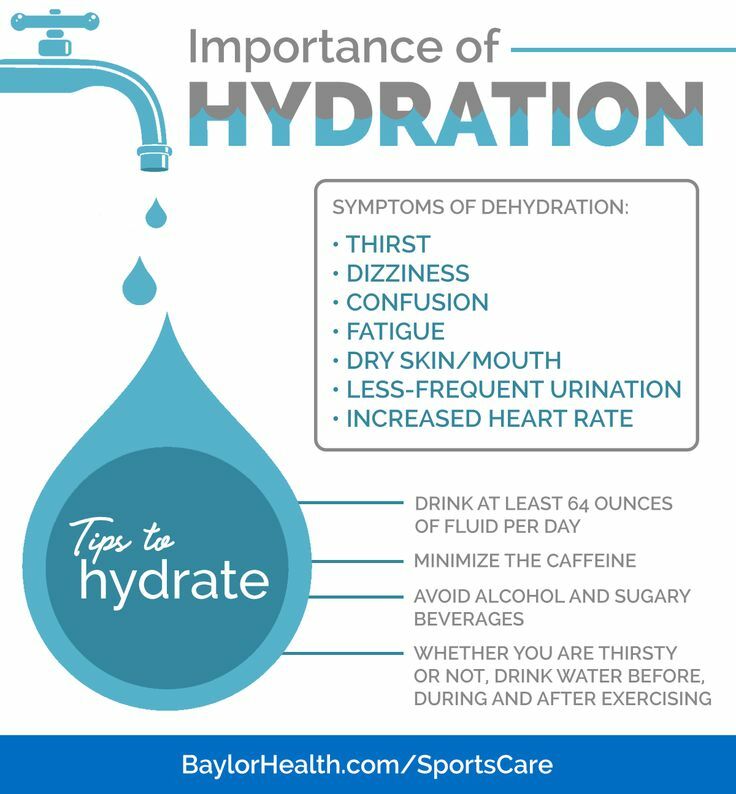 These actually cause more fluid loss if you drink them before a workout. Flavor your water with a couple of drops of lemon or lime. Or throw in a teaspoon of frozen fruit to give water a fresh new taste. We all know about cooling down after a workout. But did you know that you can cooldown pre-workout? A cold shower before you head outside before summer workouts will lower your core and skin temperature and heart rate. Leave your hair wet. It will help cool you off during your workout. Asphalt and concrete get extremely hot in the summer sun. And they radiate the sun’s rays back up. Move your summer workouts to nearby dirt or gravel pathways instead. Running and biking aren’t your only outdoor summer workout options. In fact, you can use the high temperatures to make yourself a free hot yoga studio right outside. When it’s hot outside, and your body temperature is up, you can go deeper in your poses. If you run, bike or lift a lot of weights, chances are your flexibility isn’t as good as you’d like. Make improving your flexibility your summer motivation. Head out with a yoga mat and stretch it all out. Your hamstrings, hips, and glutes tend to be tight in active women. Hold each stretch for 5-10 breath and feel yourself gain an extra inch of height. Bottom Line on Exercising in the Heat. Exercising in the heat outdoors is possible. You just need to be flexible, plan your workout and know when to call it a day. Next, check out these 5 daily exercises for women over 40.